Burlington Jackdaws added a cup win, over Goldsborough, to their league runners up achievement for the season. For the third year in succession Jackdaws claimed the cup victory in their respective age category. The game began with a lively start from Goldsborough who looked like they were determined to catch Jackdaws cold and get an early advantage. Goldsborough created a couple of good opportunities before Jackdaws got started but just couldn’t find the finishing touch. When Jackdaws did get going, they began to play good passing football with the influential Will Webb at the centre of things. Jackdaws took the lead mid-way through the first half when Webb surged into the area and shot powerfully, drawing a fine save from the Goldsborough keeper but the ball squirmed up and Kieran Jordan reacted quickest and headed the ball over the keeper and past the defenders on the line to make it 1-0. Five minutes later Jackdaws increased their advantage when Jack Gavin chased a long pass over the Goldsborough defence where he looked second best at reaching the ball but he blocked the keeper;s attempt at a clearance and pounced on the loose ball which he calmly slotted into the open net. For the remainder of the half Jackdaws asserted more pressure hoping to increase their lead but Goldsborough defended stoutly restricting Jackdaws to half chances only. Early in the second half Jackdaws did increase their lead and gave themselves a bit of breathing space. Another surging run from Will Webb brought another good save from the Goldsborough keeper but the defender’s clearance only went as far as Toby Wilson at the edge of the area. He shot first time and with the aid of a slight deflection, sent the ball into the bottom corner of the net. 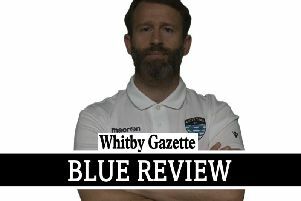 Goldsborough didn’t give up trying and they were unlucky not to get the goal they deserved when the centre forward raced clear from Jackdaws defence and did everything right but he was thwarted by a superb save with his feet from Jackdaws keeper. Goldsborough came close again with a long range free-kick just going over the bar. Burlington pushed hard again towards the end of the game trying to increase their tally but Goldsborough had two good chances in the dying minutes to reduce the difference. the ball wide of the gaping goal.